It has been a while, but Dortmund finally looked impressive again as they beat Freiburg 4-0. Bayern don’t have it so easy, but still get all three points against Bremen, who fail to score for the first time in 30 Bundesliga games. In our In Depth section, we discuss Hertha Berlin’s decision to part ways with manager Pal Dardai, who will leave the club at the end of the season. Just five weeks to go before the end of the season, and the title race is still in the balance! Bayern beat Düsseldorf 4-1, whilst Dortmund edge past Mainz 2-1. Frankfurt lose to Augsburg, with Leipzig beating Wolfsburg 2-0. After the usual analysis, we discuss Reinhard Grindel’s departure from the DFB in our In Depth section. Another Bundesliga matchday, another glut of goals! Unfortunately, in the most anticipated game of the season between Bayern and Dortmund, Munich score all five. Leipzig beat Leverkusen 4-2 in the game of the weekend, whilst Frankfurt squeeze past Schalke 2-1 with a last minute penalty to go four points clear in fourth. We discuss all of the action before moving on to our In Depth section. We talk about RB Leipzig, one of the most controversial teams in Germany, and the impact they have had on German football. The title race is back on! 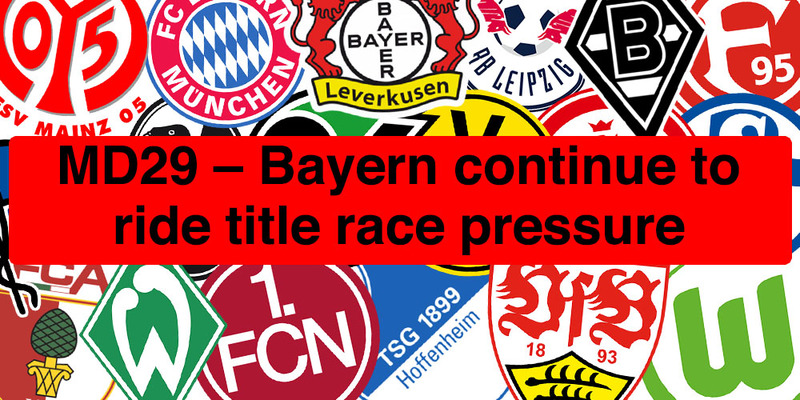 After Bayern’s recent form, it seemed that the title would inevitably be on its way back to Munich. However, the Bavarians draw against Freiburg whilst Dortmund beat Wolfsburg. BVB now lead by two points with Der Klassiker up next. At the 22nd time of asking, FC Nürnberg win, beating Augsburg 3-0. 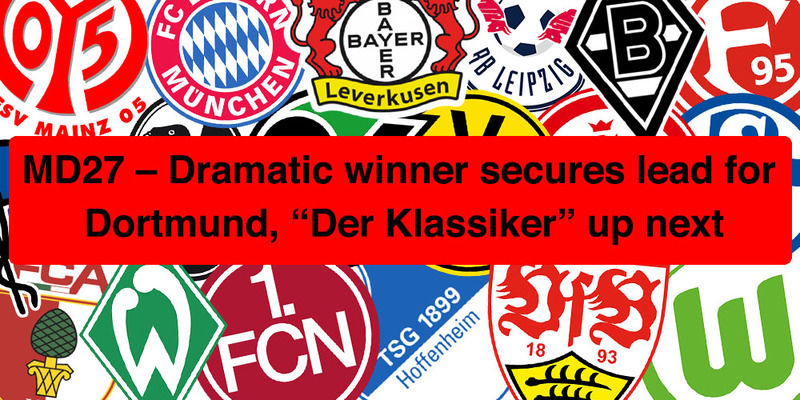 Frankfurt dispatch Stuttgart to go 4th, whilst Leipzig give Hertha Berlin a footballing lesson. After all of the usual analysis, we discuss the departure of Martin Kind from Hannover in our In Depth section. No Bundesliga football, but with the 11mm Football film festival, the Bundesliga Diaries team was kept busy! We speak to a number of the different protagonists present at the event, before our sharing our own personal thoughts. We also discuss Germany and their two matches against Serbia and the Netherlands. With just eight games left, Dortmund and Bayern are still neck and neck. BVB win 3-2 against Hertha Berlin, whilst Munich hammer Mainz 6-0. Schalke continue their losing streak against Leipzig, whilst Wout Weghorst leads Wolfsburg to a 5-2 victory over Fortuna Düsseldorf. In our In Depth section, we review the Champions League performances of the Bundesliga representatives. ‘Bundesliga Diaries’ is a weekly podcast with matchday reports and interesting stories about the professional German football leagues.